I think you guessed that I loved music that makes you bang your head around or bounce. Well I’m sorry to announce you that if you don’t like that kind music, you won’t like this post. Hah. 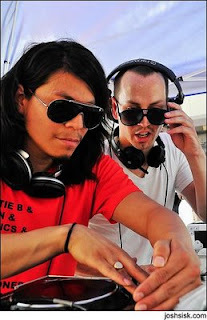 When I think groovy music, I think of many artists, but it’s often Nadastrom. His tracks sound a lot like late night tracks, but with a touch of fresh coolness. All of you probably already heard Kid Cudi say “I’ll make her say, blah blah blah” right? Guess what, Nadastrom remixed the song and the result is pretty nasty. Good music to dance to is always fun to hear. You’ll like these. This entry was posted on Thursday, September 10, 2009 and is filed under Common,DJ Gant-Man,Kanye West,Kid Cudi,Nadastrom. You can follow any responses to this entry through the RSS 2.0. You can leave a response.